One-to-one camera training is all about getting exactly the training you need. No sitting in a crowded classroom wishing the instructor would speed up or slow down. You don't pay to learn stuff you already know. You won't feel embarrassed about asking questions in front of others. All one-to-one training is tailored to suit your needs. You get exactly what you want. Maybe you have very specific questions, a project you need help with, advice on how best to use your kit. If you've bought a new camera and are struggling with the manual I can help. Let me know what camera (mics, tripod and lights) you'll be using, what type of video are you going to produce (broadcast, corporate, doc, drama, music) and your current skill level. I'll design a course just for you. Every one-to-one course I do is different, because every one needs something different. 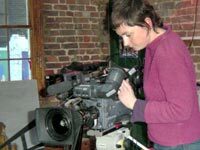 "Thank you very much for providing the one-to-one course, it was exactly what I needed and gave me the confidence to handle the camera and compose shots with at least some idea of what I was doing. The day immediately following the training I arrived on location to find that I had about 1 minute to prepare, I surprised myself by getting the camera set up and ready to roll without missing any of the action." "Just wanted to say a very big thank you of appreciation for yesterday’s training. Whilst on the one hand you opened my eyes to some of the complexity, you also gave me the confidence to start trying it out, knowing that with your training behind me it is highly unlikely I’ll make a complete fool of myself." "Thanks Christina! Wonderful training on my new camera1, easily explained, and great fun. The two day course was well organised, thorough and has helped me enormously. I would recommend you to anyone." " I went to Christina Fox for a one-to-one course on the PD 100 camera. It was for just one day but, it was invaluable. Christina was friendly, explained things very well and she even threw in lunch! I'm taking a PD 100 with me to South Africa where I will be filming some packages for BBC South East Today, the regional television news programme I work for. I'm not a complete beginner on the PD 100, but I wanted to increase my confidence with it. The full day course was intensive but it allowed me to ask very specific questions, and sometimes very simple ones! I could skip the things I already knew, and concentrate on things I was unsure about. We started off with some theory but there were lots of practical exercises too. And it's very reassuring to know that I can go back to Christina with any queries I might have." "Hi Christina, A great many thanks for a hugely informative and enjoyable day. I found the training extremely useful and can't wait to use the camera with a new understanding and confidence. I never thought I could learn so much in one day!" "The programme you set up met my requirements very well indeed. I really appreciated the professionalism and experience which obviously went into designing it. The pace in the programme and variety of techniques you use (demonstration video extracts, vox pop sequences, detailed & patient explanations) make the course very rich and stimulating. I did not believe I would learn as much and enjoy it as much. It was very much worth the trip all the way from deepest Burgundy to London." I charge individuals paying for their own training, £250 per person per day. If you want to know more call me on 020 8621 3649 or email me. (Prices include training notes and my 50 page camera workbook, for all participants. If you already have some experience, then one day will probably be enough. When it is one-to-one we can cover a lot in a day (compared to a learning in a big group), Because we can skip through the stuff you know and just concentrate on the areas you need help. If you are a complete beginner - you may not know what you need exactly. If you let me know what camera and microphones you want to learn about and what kind of projects you intend to shoot - I can design something for you. Beginners usually find two days more useful. Cameras and audio packed into a day can be a lot to take in - in one go. With two days we can go at a slower pace, do more practical stuff and keep going over things until you're happy. That said if you can only afford one day - I can give you enough info to get started, you can always do a follow up day later. Call me on 020 8621 3649 and we can compare diaries and decide when would be a good time to do the training. 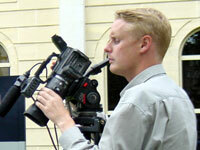 If you are buying a video camera - book the training to start some time after you receive delivery. That will give you time to have a play and build up a list of questions. Plus, I can teach you on your camera and help you set up the menus correctly. If you don't know what kit to buy, give ma a call and I can point you in the right direction. To keep down costs I do the training from my home in Ealing, West London, UK. Do you need to organise training for a group of people?